For [Patricia Mulroy, general manager of the Southern Nevada Water Authority], it is Lake Mead that tells the tale of Las Vegas' water future. The reservoir's water level fell this summer to its lowest point since 1965, when officials diverted Colorado River flows to fill the newly constructed Lake Powell. 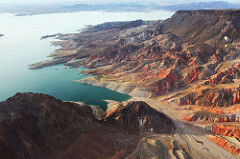 By late August, Lake Mead's elevation hovered at just 1,092 feet above sea level. Under the complex system of allotments that governs how Colorado River water is distributed to seven U.S. states and Mexico, that leaves just 17 feet of wiggle room before the Southern Nevada Water Authority must, by law, begin seeking alternate sources of water. If the lake dips to 1,050 feet, the Hoover Dam's hydroelectric power plant will shut down and Las Vegas will have to begin weaning itself off the river. It's hard to tell how soon Lake Mead could hit this ominous milestone. Already, climate change is proving pricey for Las Vegas: Water authorities now have to spend $800 million to build a brand-new intake pipe into Lake Mead, so that they can keep drawing water even after the lake level drops below the existing two intake pipes. And the state's looking to extend a new $3.5 billion pipe out to rural eastern Nevada. Those costs are pretty typical: Two trade groups recently reported that U.S. water utilities will have to spend anywhere from $488 billion to $944 billion between now and 2050 just to adjust to a shifting climate. Keep that in mind whenever you hear the argument that it'd be cheaper to adapt to global warming than cut carbon emissions—that's a potential $1 trillion tax just to adapt to changing water patterns. In any case, there's also the water-management angle. Las Vegas has instituted a "wastewater patrol" that goes around looking for houses that are spraying the sidewalk with their sprinkler or violating summer bans on midday watering. Schemes to recycle gray water from sinks into lawns are becoming popular—as are programs to replace grass with less-thirsty trees and plants. According to one new study from the University of Colorado, smarter water management could cut the risk that the crucial Western reservoirs of Lake Mead and Lake Powell run dry by one-third. That doesn't totally eliminate the problem, but it certainly helps.